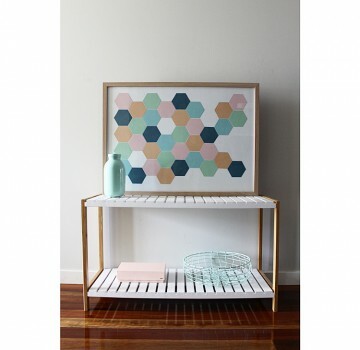 The next piece I would like to share with you in the 10 days of new products is the ‘Joy’ Hexagon frame. You will see hexagons come up a few times in this new range. After the success of my triangles, I wanted to work with some different shapes. And if you thought I was crazy with the ice cream cones and all the cutting, well wait till you hear how I made these- I traced the hexagons and then hand cut them all. Yes. Once again using the most time consuming method to create my pieces. These frames are 50 x 70cm so the perfect piece to add to many areas of the house- hallways, living areas, bedrooms.